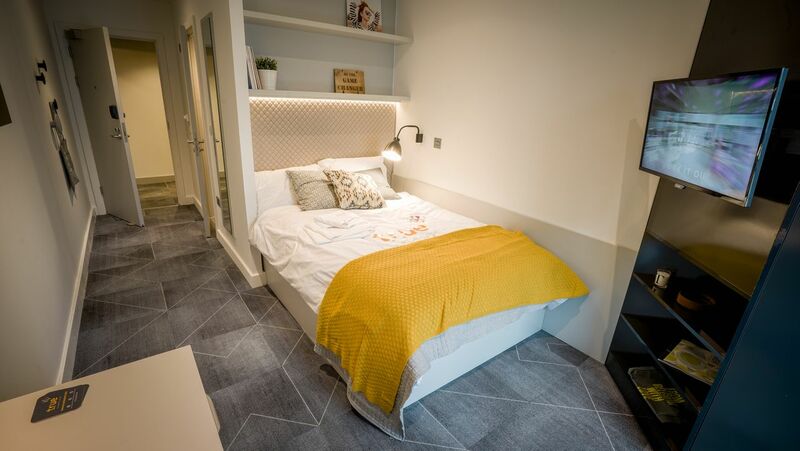 Your student accommodation is well connected, with the nearest bus stop a one-minute walk away. On weekends, order Italian pizza or pasta from Eusebi Deli, then head into nearby Kelvingrove Park for a picnic. Get your shopping fix in high-end vintage shops like Retro, then head to nearby China Town to pick up fresh produce in the grocers and bakery. Later, meet friends for dinner at award-winning Cantonese restaurant, Lychee Oriental. Gibson Street offers newly-refurbished student apartments in Glasgow with Wi-Fi and all other utilities included. You’re a six-minute walk from the University of Glasgow, and a half-hour bus ride from the University of Strathclyde. Secure cycle storage is available on-site. 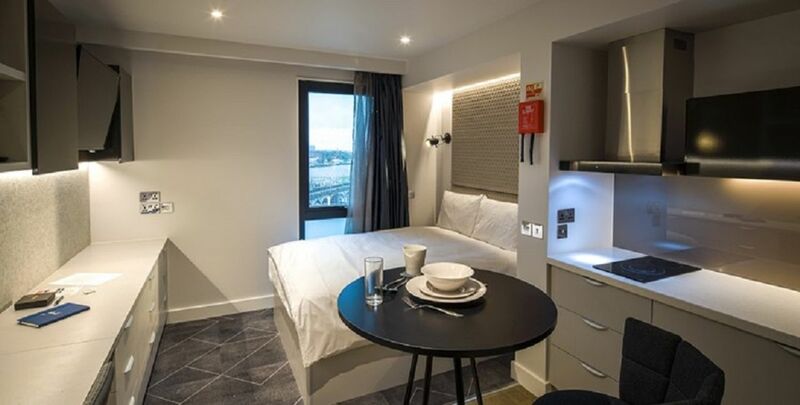 Choose an ensuite room or a studio apartment with its own kitchen. When you get home, relax on your oversized bed, or work at your spacious study desk. It’s easy to focus as contents insurance and on-site security give you total peace of mind. Later, step into your private bathroom for a hot shower, or pay a visit to the on-site laundry before cooking up a storm in the kitchen. 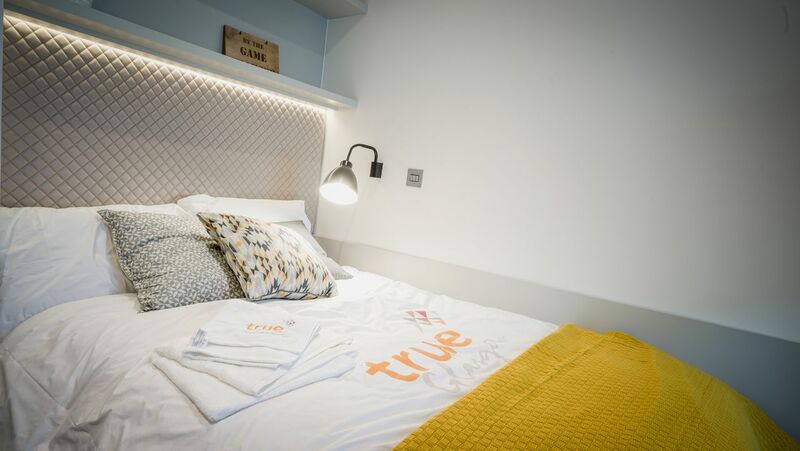 All ensuite rooms have access to a shared kitchen and lounge, while the new common room is the ideal place to relax and de-stress; enjoy wonderful views over the river, or enjoy movie marathons with friends. Free Airport Pickup!Free Airport Pickup - from Glasgow Airport and for check-ins in September only! T&C's apply. Application deadline of the 1st August. Free Comfort Pack!Upon move in you'll receive a free comfort pack worth £250! This includes pillow, duvet, bedding, crockery, cutlery and kitchen utensils so you'll instantly feel at home once you've arrived! Get in quick for this limited offer. Free Dual Occupancy!Free Dual Occupancy. Limited Offer! Hurry get in quick only available for the first 15 rooms to be sold. Only on true club suites and true club XL room types but applies to any tenancy length. Guarantee Offer!Free cancellation for any booking when provided with proof of the following; *You fail to get the results to attend that City and university you selected; *Your VISA is declined; Or you choose to move to another City where we are yet to have a true accommodation. Wir haben leider keine Unterkunft gefunden, die deinen Wünschen entspricht.Alle Privatzimmer in True Glasgow West End ansehen. Wir haben leider keine Unterkunft gefunden, die deinen Wünschen entspricht.Alle Ganze Wohnung in True Glasgow West End ansehen. If you book your room before 31st July there is a 14 day cooling off period. After the 31st July, the cooling off period becomes 48 hours. If you cancel within 14 days (or 48 hours after 31st July), you are entitled to a full deposit refund. Once you have booked and the 14 days has elapsed (or 48 hours after 31st July), you are bound into a legal licence agreement which requires you to pay the rent for the full period of the licence agreement. If you wish to cancel your booking once the 14 days (or 48 hours after 31st July) you will remain liable for the contractual obligations laid out in the Tenancy Agreement unless you can offer proof you fit any of the following criteria: you fail to get the results to attend that City and university you selected your VISA is declined Or you choose to move to another City where we are yet to have a true accommodation. In some cases we're willing to cancel the booking if a replacement tenant is found who will take on the full rent liability. This decision will be made by the management team at their discretion.